There are new images for this new board. Special thanks to Germán Daniel Rotondo, who took these photos and added the labels. 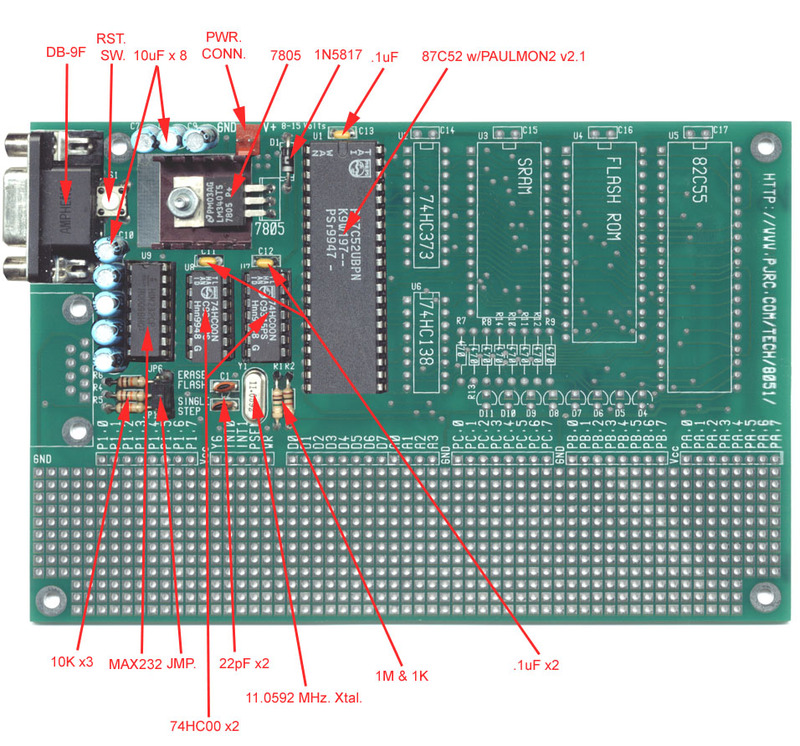 These diagrams below depict the parts used on an older version of this board. Please use these three updated images. The circuit board should be assembled in three steps. At the end of each step, the board can be tested to verify that it is working, which makes finding any errors (such as poor solder joints) easier because there are fewer new parts to search. 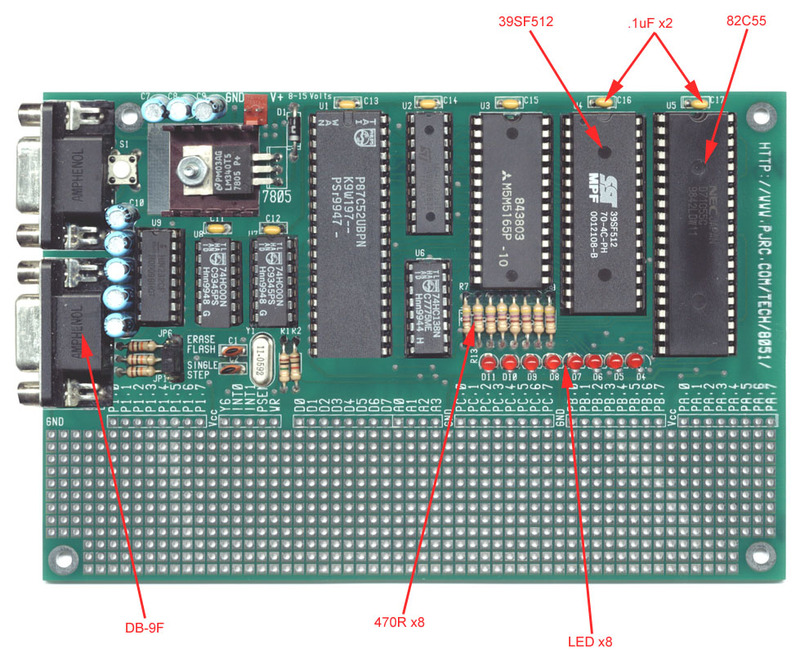 Many people have assembled the entire board and had it work on the first try, but it is suggested that the board be assembled and tested in the steps shown here. Each step is described briefly, with notes about areas that require special attention. A detailed procedure for testing the circuits added in each step is provided. No familiarity with PAULMON2 or 8051 assembly language programming is required to perform these tests (in order). Though there is a lot of material presented here, the circuitry is designed and this material is arranged so that the construction can be accomplished easily in three steps. By performing the tests described here after each assembly step, the task of locating and correcting any problems is made as easy as possible. The first step only requires two chips and most of the passive components. This first step does not require a large number of solder connections, and it will allow you to work out the details of communication with the board before it contains many more parts. These images still need to be updated for the latest board... I'm sorry that they're not ready yet. The upper two jumpers, labeled JP8 and JP9 must be added. These allow the serial port to communicate without adding the two 74HC00 chips. A 11.0592 MHz crystal is recommended, because the 87C51 can generate fast baud rates using this crystal. Any ordinary cyrstal between 4 MHz to 12 MHz should work. The AT-strip (very miniture) crystals should not be used, however. The resistors may be 5% or 1% types. Of course, capacitors with a higher voltage rating than shown above may be used, and if necessary a "similar" value may be substituted, such as 4.7uF instead of 10uF. Finally, the 87C51 (or 87C52 or compatible) must be programmed with PAULMON2 before it is added to the board. It is a good idea to use a socket for the 87C51 chip, to allow the code inside to be changed later. Connect the serial port to a COM port on a standard PC computer. A terminal program should be run. Windows "Terminal" or "HyperTerminal" will work. Procomm and Seyon (unix) are also good choices, though nearly any terminal emulation program will work. The terminal program should be set to a slow baud rate, such as 1200 baud, 8 bits, no parity, 1 stop bit, no flow control. Connect a five volt power supply to the board. The voltage must be between 4.5 to 5.5. The 12 volt input on the board is not required, and it's a good idea to leave it unconnected until it is needed. See PAULMON2.DOC, PAULMON2.EQU and PAULMON2.HDR for more information. If you do not get this message, then something isn't correct. Add a web page about troubleshooting each stage of construction and make a link from here to the troubleshooting section for step #1. Once you get the PAULMON2 message, feel free to explore the PAULMON2 menus and features. Some operations may have no effect until after the RAM chip is added in step #2, but the program should be able run correctly without any of the other chips that will be added in steps #2 and #3. You may want to try increasing the baud rate, which requires turning the power off to the board, because PAULMON2 attempts to remember the baud rate so that it won't need to be auto-detected if you restart by pressing the reset button on the board. Using the 11.0592 MHz crystal, PAULMON2 should work correctly at 19200 and 57600 baud (the 8051 can not generate 38400 with this crystal). Many programs that run on a PC, particularily under MS Windows, can not reliably communicate at these speeds. Other crystals, even faster ones, may not be able to work at fast baud rates. See the Automatic Baud Rate Detection in the code library for more details. When you're ready to begin solding again, proceed to the next step where you will gain the ability to download your own programs to the board and run them. In the second step, you will add three more chips to the board. 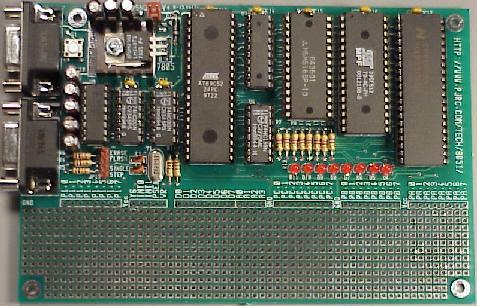 The 6264 chip is a 8k by 8 bit RAM chip (64k bits). The other two chips allow the 87C51 to use the RAM chip, as well as other chips which will be added in step #3. 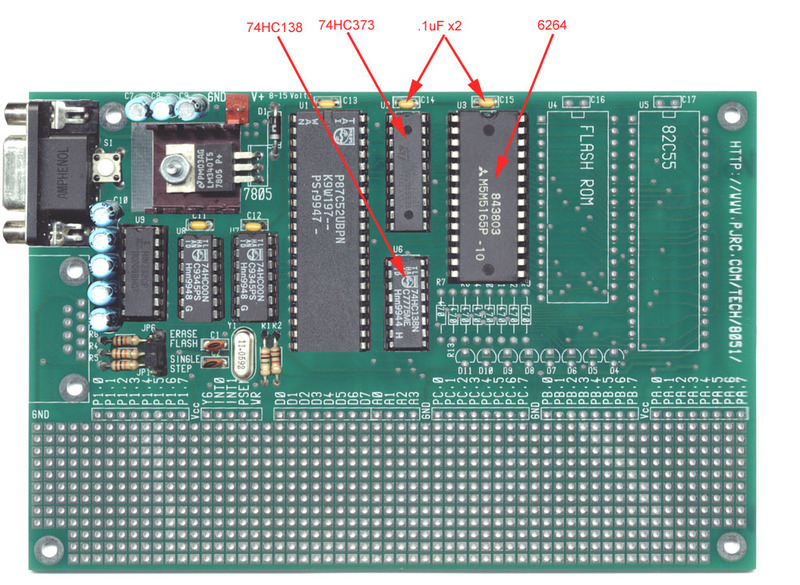 After these 3 chips are added, you will be able to download your own programs to the board. As PAULMON2 receives the data, it is writes it into the RAM chip. Of course, you can run your program once it's in the RAM chip, as well as make use of a number of other features of PAULMON2. Like every other chip, it is important to orient the chip so that the notch faces in the direction shown. It is not necessary to use sockets for these chips. In most cases where the RAM is not working properly, an error about "Unable to write" should appear. Other types of errors, such as checksums, unexpected hex digits, etc usually indicate problems with the download process. If you do get any errors or the download process doesn't appear as shown above, go to the step #2 troubleshooting section. It is important to download the EX1_2.OBJ file, because it is assembled beginning at memory location 2000 (hex). The EX1_4.OBJ and EX1_8.obj files are assembled at 4000 and 8000 (hex), for boards which have memory in those ranges. When the 28F256 chip is added in step #3, there will be memory from 8000 to FFFF, and you should be able to download EX1_8.OBJ to the 28F256 chip. Once the program has downloaded sucessfully, you can run it with the JUMP command (press "J"). The memory location to jump to should be 2000, and it will probably be the default location. If this message appears only briefly and then the system restarts, it is probably a sign that your terminal emulation software is configured to send CR/LF when you press Enter. If this is the case, it should be set to only send CR (ascii code 13). At this point, you can download programs to your board. You may want to try writing a few simple programs, perhaps by copying and pasting bit of code from the EX1.ASM program. This program, like PAULMON and the examples in the code library, is in the public domain, so you can use whatever parts you find useful in your own programs. It may also be helpful to look over the PAULMON2 Documentation. It won't be long until you'll want to have additional features on your board, which are added in the last step. Once the first two steps are completed, the board may be used, but only for serial I/O on the one connector used with PAULMON2. This final step adds three additional features, each of which is independent and may be added with or without the others. The 82C55 chip adds 24 I/O lines in three aditional ports. These ports are accessed differently that the 87C51's built-in ports, but they can be quite useful for controlling or communicating with other devices. A group of eight LEDs are connected to one of these additional ports. These can be useful for troubleshooting programs where it is not feasible to send troubleshooting data to the serial port (call to PHEX, COUT, etc). The 28F256 adds 32k of additional space to store programs. The 28F256 is a non-volatile memory chip, so your programs will remain in the chip without power. PAULMON2 provides features to identify your programs, so it is possible to have PAULMON2 run your program automatically when the board is reset, so the board can be dedicated to a particular task after your code is working without reprogramming the 87C51. One of the jumper tells PAULMON2 to erase the 28F256 when the system is reset, in case you need to make changes to your code and download a new version. Of course, your program can also use portions of this chip for non-volatile data storage. PAULMON2 provides built-in routines your program can call to do the steps required to write/erase the chip. The other serial port connector and the two 74HC00 chips provide another serial port. The 87C51 only has a single UART, so only one of these connectors can be in use at a time. However, many applications require the serial port for communication with some device other than a PC. When writing code for this sort of application, the first few lines would clear a port pin (P3.5) to switch the UART to the other connector, and perhaps change the baud rate and other serial communication parameters. If the board's reset pushed, the first serial port connecter will be used and PAULMON2 can be used to download a new verison of the code. This saves a lot of time and trouble switching serial cables every time the program is run, and it is possible to switch back and forth, such as briefly sending some troubleshooting data to the first serial port. Each of these three sections functions independently and may be added when it is needed. As always, it is important to orient the chips in the correct direction, with the notches as shown above. Also, two additional electrolytic capacitors should be added if they are not already on the board. The resistors shown in the placement diagram as 470 ohm, but this value may be adjusted to achieve the desired intensity on the LEDs. Values lower than 220 ohms should not be used. If the signals of port C are used to drive other circuits than the LEDs, the voltage when the signal is low (LED on) should be checked (see below). The circuit board layout will not fit standard T1-3/4 LEDs. A flat rectangular size is required. To test the 82C55 chip, download the LED Blink Test Program, which is also available in a ZIP File. This program blinks the LEDs in a back and forth pattern. It can be easily modified to blink in different patterns. Describe how to check low voltage to see if resistor values are too low. Provide a second program which prompts for number to write to the port, and leaves it that way, to make testing the voltage easier. 28F256: download ex1_8.obj. Should work as before, but it will remain in memory after power goes out. Make sure to test the erase feature, with Menu in PAULMON2 and with the jumper. Should also provide a test program to download which illustrates how to use the flash rom for storing and retreiving and overwriting (pseudo-erase) data. 2nd Serial Port: download a (not yet available) test program... describe what the results should be. This program should do so interesting I/O on both ports, and illustrate the technique required to switch between them (waiting for TI bit). Of course, there is a substantial prototype area which can be used to add your own circuits. Should create a web pages with example circuits and make a link to it from here. What should the examples be? ?